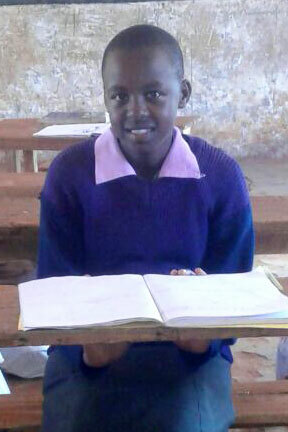 Fourteen-year-old “Doctor” Purity is very aware of the health issues in her community. She has taken the initiative to take classes on the importance of washing hands, and she passes all of of this information on to her peers. She is in charge of ensuring that students wash their hands after visiting toilets, and she makes sure her hand washing kit is always stocked with water and disinfectant. She has been elected as the school health secretary, a post she holds with great passion. She dreams of working in the medical field, and she works very hard in school in order to make her dream a reality. However, Purity fears her hard work will be for nothing, as her parents are unsure how they will afford the funds necessary to send her to secondary school. They already have problems maintaining her and buying her school supplies at primary level. She has had to depend on her schoolteacher’s sympathy for this support. This strong, bright girl needs someone to encourage her to keep up her good work.